This past week Gutsy Cooks decided to join the masses and have open choice with our menu options and celebrate the upcoming Super Bowl madness. The theme was to post our favorite game food. Originally, we planned to have a couple of friends over for the game and that plan crashed and burned and it ended up being just us on a Sunday night. Or actually just Tom, since I’m not a big football fan. But, let me totally get off topic here and give a HUGE SHOUT to Madonna. You ROCKED the halftime show…you still got it, you still made get up and VOUGE! *cough, cough* Back to our main topic… our dinner. I knew that we were not going be eating finger food, so the only option for a dinner was the Chili and that was my starting point. I gutsied up the whole thing, omitted some stuff, added others and totally went rogue and built my chili as a Sheppard’s pie. I wanted to bake some corn bread to go along with the chili and then had a light bulb moment and thought, why not add the corn bread ON TOP of the chili and bake it? Was it a hit? Was it a miss? The chili was a home run, or I should say, a TOUCHDOWN! The corn bread was good. On top of the chili? Sort of. I know what went wrong (to much corn bread topping, not enough chili at the bottom) and will totally try again with some modifications (bigger dish, less topping on top). But our quarterback of the night - “Mr. Chili” was working it. It came out perfectly, spicy, creamy, I used ground beef, pork and pinto beans and a secret ingredient that brought forth all of the flavors. This recipe also gave the opportunity of trying some canned tomatoes that were sent to me by Red Gold. They contacted me a couple of weeks ago in order to get the word out about their efforts in ending hunger in America. And sent me a sample of their products for me to give them a try. I’m always impressed when a company invests their efforts in the fight against hunger. And Red Gold was not shy about it. This past January 26, the company made a 15,000 pound food donation to Feeding America Tampa Bay. It makes me proud to use products from companies that want to make a difference, that are committed in being responsible and giving back to their communities. 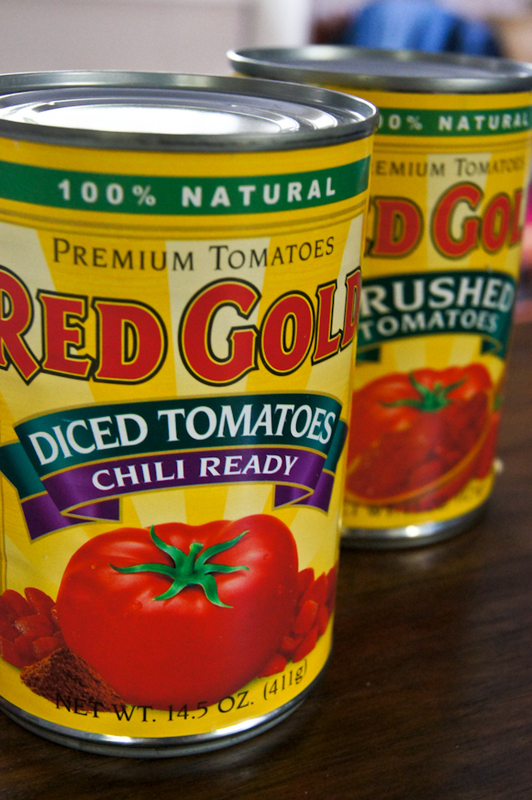 Red Gold products have earned a spot in my pantry. 2 cans red kidney beans, rinsed. Heat the oil in a very large pan and fry the onion and garlic until it begins to soften. Add the chili flakes, coriander and cumin. Add the peppers and season with salt and pepper and cook for about 2-3 minutes. Break up the ground beef/pork into the pan and, using a fork, keep turning it to separate it as it browns. Add the chopped tomatoes, ketchup, tomato puree, and water stirring to make a rich red sauce. When the chili starts to boil sprinkle on the cocoa and hot sauce (if you are using) and stir it in. Taste at this point, I found that I needed to season it with a bit more salt and pepper. If you have a chicken bouillon, add 1 to it. Add the beans and simmer partially covered for 1½ hours. At this point you can cool and freeze the chili, or just keep it in the refrigerator overnight. Make cornbread mix as directed on pouch, substituting cream style corn for the milk and adding the egg and melted butter. Pour the cornmeal topping over the chili, and using a spoon spread to cover the top as evenly as possible. Sprinkle the cheese over the top of the cornbread and then bake in the oven for 30 minutes or until the cornbread topping is golden and the chili underneath is bubbling. How long this takes depends on the how cold or hot the chili was when it went into the oven. You may find it easiest to reheat it on the stove in its pan first if you had it cold in the refrigerator. Now watch people fight for it!